I hope you've been enjoying our Tea Party this week! One more day to go and it will be a lot of fun, too. (I saved the actual tea giveaway for last, don't ya know…) It's been fun having so many visitors, I hope many of you will continue to stop by from time to time. And aren't my co-hosts fun? I wish we could be doing this in real life, too! Can you believe it's Wedgwood?! Yes, that Wedgwood, but it was specially commissioned for the FLASH restaurant at the Royal Academy of Arts in London. The artist is Will Broome, a UK illustrator who is apparently very fond of pandas. When I first met Bob, he was doing a lot of paintings of cartoony panda bears (they were the forerunners of his current life sized panda bikini girls), so this pattern really makes me nostalgic. I never did register for china… this is honestly the first set I've thought was really "me." I wish I could afford it! If anyone has a Wedgwood hook-up, let me know! Just dropped in from 7 Clown Circus to tell you that you are AWESOME! I love your blog and the time it takes to come up with all the cool things on it. Fabulous post! :) Happy Thursday! This would go perfect with your Panda Girl Sculpture. I love it, and no, I can't believe it's Wedgwood. This IS so you, isn't it? So whimsical and unique. Wedgwood? Never would have guessed. Maybe you'll have to get remarried in one of those spectacular ceremonies to get more gifts. Angie suggested we leave compliments for the ladies of the Tea Party. I am really enjoying this week and getting to know all of you. I think it's great how you combine giveaways and product reviews with your passion for educating people about the environment! What a cool set. Very unique! 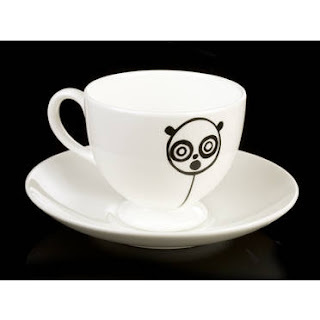 I love the Wedgwood Panda China! I never registered for china either. I cannot hook you up with Wedgewood, sorry. However the set you are displaying is adorable.